Shortly after 10:00 a.m. 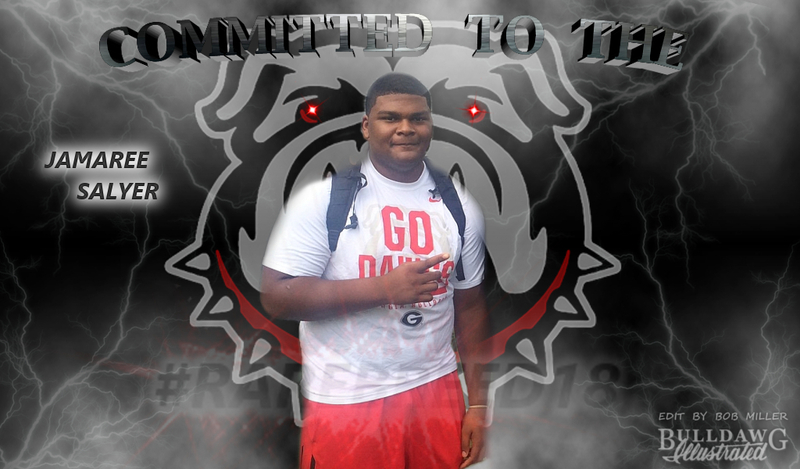 ET on Wednesday morning, Jamaree Salyer announced his decision to commit to the Bulldogs and has signed his National Letter of Intent with the University of Georgia. Salyer has over 30 scholarship offers and chose to commit to UGA over the Clemson Tigers. The 6 foot 4, 342 lbs five-star prospect out of Pace Academy is considered to be one of the top offensive guards in the 2018 recruiting class. 247Sports has him rated as the No. 1 OG as does Rivals while ESPN has him listed as the No. 2 OG. Salyer is also considered to be one of the top players in the country with 247 ranking him No. 12 overall, Rivals No. 9, and ESPN No. 28. He has been selected as a U.S. Army All-American and is slated to play in the 2018 U.S. Army All-American Bowl on Saturday, January 6, 2018. Salyer will join the 2018 freshman class at Georgia this upcoming summer after graduating from Pace Academy. He is the fourth offensive line prospect that coach Sam Pittman has recruited to UGA for 2018 joining Bishop McGuinness’ Owen Condon, North Gwinnett’s Warren Ericson, and Houston County’s Trey Hill. Avid lifelong football fan of the Falcons and Bulldogs, digital and multi-media support for Bulldawg Illustrated, host of BD Illustrated ON-AIR, dabbler in graphic arts, and peach cobbler fears me.